Standing 60 metres high, Netjerikhet's Step Pyramid, the oldest pyramid-like monument built in Egypt, was the centrepiece not only of the Netjerikhet complex but of the entire Saqqara area. On a bright day its distinguishing shape can be easily seen from as far as Cairo or Giza to the North, and Meidum to the South. The Step Pyramid has gotten its modern-day name from the fact that it is not a true geometrical pyramid, but consists of 6 rectangular steps, each step smaller than the one beneath. Although it was not the only Step Pyramid to have been built in Ancient Egypt, it is the only one to have have been preserved in such good conditions. At least two of Netjerikhet's successors, Sekhemkhet and Khaba, started building Step Pyramids, but neither was completed. The pyramid at Meidum was started as a Step Pyramid, probably already by Snofru of the 4th Dynasty, but is was reshaped as a true geometrical pyramid during that same reign. Also during the reign of Snofru, several smaller Step Pyramids were built throughout the country, but they were built of mudbrick and are not in the same pristine shape as Netjerikhet's Step Pyramid. 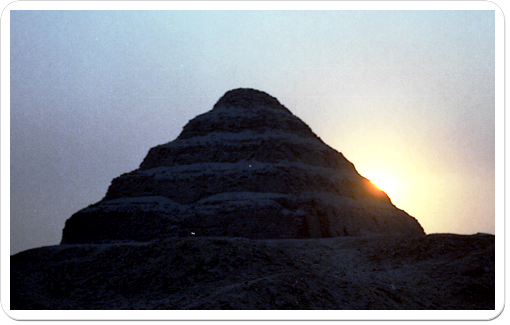 Sunset at Netjerikhet’s Step Pyramid. It is with the Step Pyramid that it becomes most clear that the entire complex was built in several stages. Initially, both the shape and the size of Netjerikhet's funerary monument were a lot more modest: a uniquely square mastaba, consisting of a core of local stone encased in an outer layer of limestone, stood slightly off-centre in a rectangular enclosure wall (stage M1). At this stage, the complex was very similar to the valley enclosure of Khasekhemwi, the last king of the 2nd Dynasty, at Abydos or probably also to the structure known today as the 'Great Enclosure' at Saqqara. The mastaba's sides were oriented approximately to face one of the four cardinal points. When the first stage was completed, the mastaba was extended by about 4 metres on each side and a second encasing of fine limestone was added (stage M2). 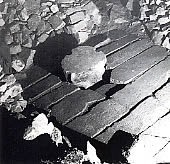 This extension, however, was slightly more than half a meter lower than the original mastaba, M1, so that the resulting mastaba M2 was in fact a stepped mastaba. As such, it was reminiscent of an archaic mastaba of the 1st Dynasty at Saqqara, which lay to the North, but which had more steps. From mastaba to step pyramid: the different stages in the building of Netjerikhet’s Step Pyramid. Source: Lehner, Complete Pyramids, p. 87. This stepped mastaba was enlarged towards the East only by some 8 and a half metres (stage M3). Again, this enlargement was somewhat lower than the former stage, so that M3 was a rectangular, stepped mastaba, with two steps on the East side and one step on the three others. Before the casing of this East enlargement had been added, the design was, again, changed. The mastaba of stage M3 was extended by some 3 metres on all sides and was converted into a regular, rectangular mastaba, without any steps. This mastaba became the first step in what was to become the Step-pyramid. At first, three mastaba-like structures were stacked on each other and on the lowest mastaba, resulting in a 4-stepped pyramid of some 40 metres in height (stage P1). This structure was largely extended towards the North and the West, and somewhat towards the South and the East. Two additional steps were then added resulting in the final 6-stepped pyramid (stage P2). The pyramid was completed when it was encased entirely in limestone. The substructure of the pyramid too was built in stages and altered to compensate for the increasing size of the superstructure. It consisted basically of a great Central shaft of 7 metres square and 28 metres deep, that gave access to a maze of corridors and rooms. With its more than 5.7 kilometres of shafts, tunnels, chambers and galleries, this substructure was without parallel both in size and complexity among the other Old Kingdom pyramids. 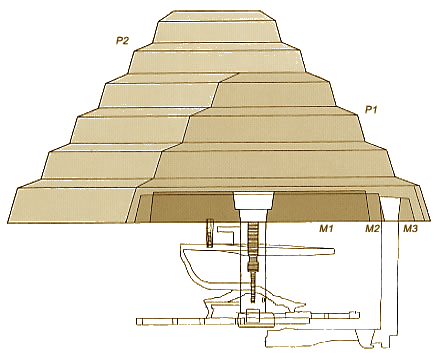 3-D drawing of the pyramid substructure. Left inset: cutaway of the pyramid. Right inset: plan of the substructure. The Eastern Galleries, in yellow, are not shown in the 3-D drawing. At the bottom of this Central Shaft, a granite vault, measuring 2.96 by 1.65 metres and with a height of 1.65 metres, was constructed as Netjerikhet's final resting place. Jean-Philippe Lauer, who has spent an entire lifetime examining and restoring this funerary complex, has found evidence that there may have been an earlier vault with walls of alabaster and a pavement of schist or diorite. Limestone blocks with a decoration of large five-pointed stars, which had been re-used, must originally have formed the roof of the first burial vault. If so, then this is the first known example of a ceiling decorated with stars, a motif that would continue to be used in the royal burial chambers or tombs for centuries. This motif symbolically denotes the burial chamber, even though it was located under ground, as a micro-cosmos, with its own sky. Some mummy parts, among which a foot, were found in the burial vault. 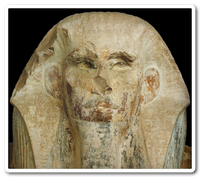 The mummification technique used on these remains are characteristic of the oldest mummies of the Old Kingdom, so it was long assumed that these were the remains of Netjerikhet himself. A recent carbon dating, however, has dated these remains to several centuries younger than Netjerikhet. 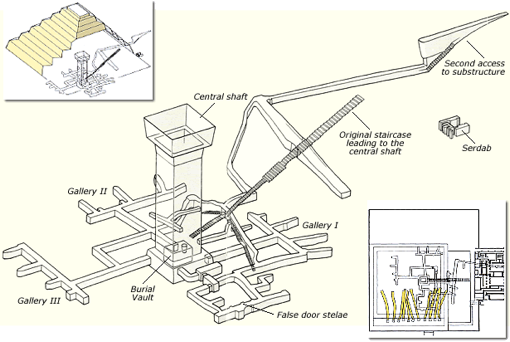 The granite burial vault at the bottom of the pyramid’s central shaft. The only opening that the builders left in the vault was located in the North part of the roof. It was through this hole that the royal remains were introduced into the vault, after which the hole was closed by a 3.5 ton granite plug with a diameter of 1 metre and a height of 2 metres. During the first stages (M1 through P1), a descending passage was cut in the rock from the North, connecting to the Central Shaft. At its most Northern point, it reached ground level and could used by the builders to clear out the waste of the Central Passage. As the surface of the pyramid was enlarged, the descending passage got covered by it and became unusable. A new access to the substructure was therefore created, which begins as a trench to the North of Pyramid P2, inside one of the chambers of the Northern Temple. From this opening and after a flight of stairs, a passage of 1.8 metres in height goes slightly down to a large Gallery that opens to the left and at one point, about halfway its length, crosses the original descending passage. At the crossing of the second access corridor and this Gallery, a robbers passage, perhaps dated to the end of the Old Kingdom, bores down into the rock. From the bottom of the Central Shaft, passages in all but the Eastern shaft wall lead towards 3 sets of crudely cut magazine galleries. In the East of the Shaft's wall, another passage opens unto a set of corridors and chambers, decorated with rows of blue faience tiles set in the limestone, perhaps an imitation of the reed-mats that adorned buildings for the living or even the king's palace. This decoration was organised in 6 panels, three of which were topped by an arch of blue faience Djed-pillars. In the West-wall of the Eastern-most of these chambers, there are three false door stelae, showing Netjerikhet performing a ritual run and visits to shrines. The east-wall of this room was apparently never finished. The builders left it roughly hacked from the rock and the decorators appear to have finished their job in a hurry. Two further rooms, believed to represent the king's inner apartments, were fully decorated with faience tiles. Their doorways were framed with Netjerikhet's name. 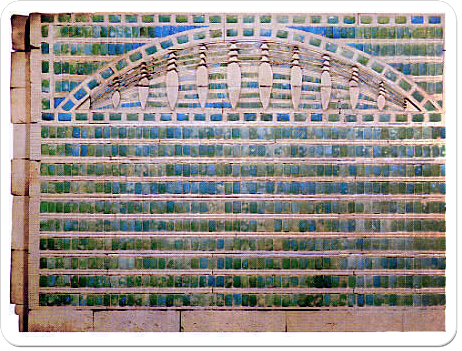 Some of the chambers underneath the pyramid were decorated with blue faience tiles. It is not impossible that the three sets of magazine galleries were also intended to receive such an exquisite decoration. The similarity in shape of these three galleries and the difference with the structure of the corridors and chambers on the East side, however, may suggest that their purpose was entirely different. Before the extension of stage M3, 11 vertical shafts were dug to the East of the mastaba, to a depth of about 33 metres. At the bottom of each shaft, a long gallery extended to the West, underneath the superstructure. The northern most of these galleries could be reached by a staircase outside of the final Step-pyramid. At least four of these galleries were used as tombs: two of them contained an intact alabaster sarcophagus, and fragments of other sarcophagi were also found. One of the intact sarcophagi appears to have contained the remains of a child. In the room at the end of one of the Eastern galleries, the hip-bone of an approximately 18-year old woman was found. The long-held belief that these Eastern galleries were tombs for the direct members of Netjerikhet's family has been contradicted by a carbon-dating of one of the female remains, that has shown at least the examined body to have been several generations older than Netjerikhet. Fragments of vessels made of alabaster and other fine stone, were also found in the galleries. Based on the inscriptions they bore, most of them were not made for Netjerikhet, but were probably older. A seal impression found in one of the galleries, on the other hand, gave the Horus name of Netjerikhet, which indicates that at least this shaft had been accessed in Netjerikhet's time. Were the galleries part of Netjerikhet's funerary complex, or were they perhaps older and accidentally stumbled upon when work on the complex was started? Does the seal impression with Netjerikhet's name indicate that the burial found in the galleries occurred during his reign, but that older mummies, perhaps members of Netjerikhet's ancestors, were (re-)buried, or that an existing set of burials was examined?